Each of the previous two flights of stairs presented unique challenges to solve... and the final flight (shown here) was no exception. The challenge presented by this flight of stairs, was "how to support the landing?" Three of the four corners of the landing could be tied into the stud walls, but how to support the fourth corner? The answer, it turned out, was to "add another timber to the house." A 6x6 would have been more than sufficient, but I had an 8x8 handy and did not want to fire up my sawmill to cut only one timber. I slid the 12 foot oak timber from a farm wagon, into my truck and drove up the hill to the house site backwards so it would not slide out the back of the truck bed. The white oak timber had sat, uncovered, in the weather for a year, but all it needed was about 1/32" planed from the surfaces and it looked brand new. 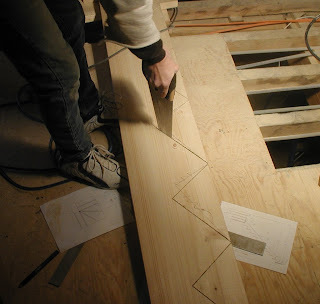 Timber addition begins with subtraction, so my brother-in-law began subtracting wood chips from the timber itself, and I began subtracting chips from the two house timbers that would be receiving the new timber. About 15 minutes into cutting, quite irreversibly, on my house frame with a power saw, I laughed to myself. It wasn't just the fact that I was hacking away on my house frame that caused my mad laughing - it was that I was completely comfortable, and somewhat satisfied, committing said act. It was not possible to use mortise and tenon joinery to add the timber to the house this late in the game. What I came up with was to "let-in" the timber into the sides of two existing timbers. I cut housings (or "recesses") into the existing house timbers while my brother-in-law created matching lap joints on the new timber. Cutting and chiselling green wood on saw horses is a lot easier than working partially dried timbers within an existing frame. It gets especially difficult working from a ladder, on a timber above you, with nothing but an empty stairwell beneath you. Occasionally, I would turn my head sideways and literally dump the saw dust from my ears. After we finished the joinery, three of us lifted the new timber into place. That was no easy task - there was no way to use the crane to help us, now that the house was dried in! It fit much better than expected. In fact, the new timber has been in place for a couple of days now and we haven't added so much as single bolt or peg to hold it within the frame. This final picture shows the newly added timber before we built the stair landing and stairs around it. I was hoping to save the doors in the background for another blog entry, but here, in full view, you can see the beautiful cherry and quarter-sawn white oak doors that our friend built for us. He has been installing them, next to us, while we've been building the stairs. They make the "house project" look more like a finished home already. 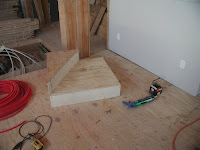 There seemed to me 3 options for building stairs in our timber frame home. #1. fashion "airy and open" stairs solely from timbers and solid plank boards. #2. build "closed stairs" with typical building materials or #3. build partially open stairs with typical building materials, inserting timber supports and beefy timber-like handrails where appropriate. Given my limited experience at stair building (the basement stairs were my first), and my small supply of sufficiently seasoned wood, Option 3 seemed like the best comprimise between aesthetics and "gettin 'er done," so option 3 is what I chose. These U-shaped stairs link the 1st floor to the second floor. They have a rise of 7 + 25/32" and a run of 10". The landing is 3'x6', with a step in the middle. As with the basement stairs, head clearance was the biggest design challenge that the 1st floor stairs presented. 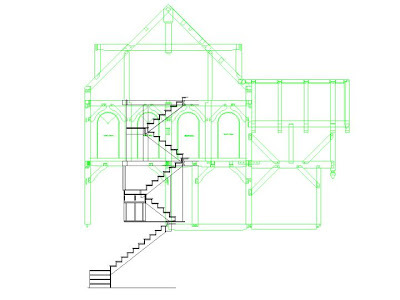 Had I known something about building stairs when I designed the timber frame, I might have designed the timber frame differently. Ah, but hindsight is 20/20. The problem that needed to be solved for the first floor stairs was that the stringers beneath the 1st floor stairs were too low, and created head bumpers above the basement stairs. I solved this by laterally offsetting the 1st floor stairs a bit from their intended location, shrinking the landing a bit, and by leaving out the middle stringer in the upper half-flight of stairs. Having only 2 stringers instead of 3 will require me to install thicker treads so they won't feel so bouncy in the middles, but this was the easiest (only?!) solution I could come up with. In order to keep the basement as a seperate and isolated heating zone, it was necessary to close in the stairs with the dry-wall you see in the second picture. Behind that drywall is a thin wall (built of 1.5" x 2.5" studs) that forms the basement stairwell. 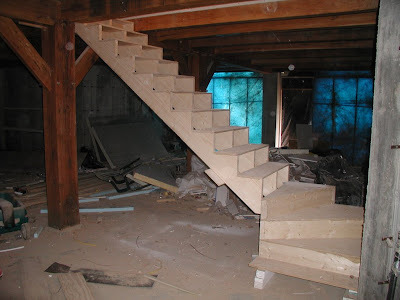 I snapped this last picture before we began building the 2nd-to-3rd floor stairs. It's a birds-eye view of the 1st-to-2nd floor stairs taken from the 3rd floor. Like the basement stairs, I intend to cover these 3/4" plywood treads with 3/4" hardwood treads and risers. The hardwood treads will have a bull nose that overhangs the risers by about an inch, making the treads 11", even though the actual run of the stairs is still only 10". For several months, we've been using three bucks of rusty, rickety old stair-scaffolding to go between the 1st, 2nd and 3rd floors of the house. (and to get to the basement, we had to go outside and walk down the hill) I traded 8 round bales of hay to "borrow" the reject scaffolding, so I considered the use of the scaffolding a real blessing. But it was finally time to see it go. The first flight of stairs we built was from the basement to the 1st floor. I mean - how badly could I screw up the basement stairs? Seemed like a good place to practice (and we were really tired of going outside in order to get something from the basement). 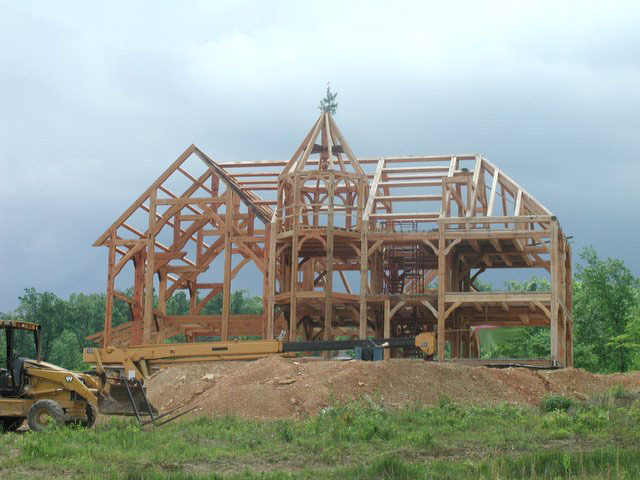 I had exact dimensions that I could measure on my timber frame, as well as a CAD model of the timber frame in the computer. This would make laying out the stairs a little bit easier. But step one was to aquire some knowledge. I searched the internet for stair building tips and ideas. Time invested: 4 hours, payback: marginal. Then I bought a book at Lowes for $7. Time invested: minimal. Payback: huge. Finally, I consulted a deceptively titled book called "International Building Codes." My uncle gave me his copy of the book when he heard I was building a house. The title is deceptive because the building codes have little to do with anything outside of the US. In fact (and thankfully), these onerous codes do not apply in our region. But when there's not some bureaucrat lording over you with this book in his hand, it could be considered as a book of "suggestions you might want to consider." That's how I take it anyway. And there are some good guidelines for building stairs in this book, but instead of keeping you in suspense, let me go ahead and admit that my stairs would not meet these codes. My first realization was that my 2 year old stair plans for the basement would not work... at all! This was a serious discovery, because re-arranging timbers in a timber frame at this point in the game was simply not feasible. I had known all along that I didn't have room to run a straight set of stairs from the 1st floor to the basement. Of course, I thought, I'll just stop the stairs at a landing and then turn 90 degrees and put another small set of stairs from the landing. What I hadn't realized was that the head clearance on that landing would be a mere 5'3" above the edge of the landing. Whoops. By shortening my landing from 41" to 36", by scrunching my stair treads from 10" to 9 & 3/4", and by notching into a large timber 3," I could fit another step in the primary flight of stairs, but still the head clearance was only about 6 feet at the edge of the landing. What is worse? - stairs where you can see that you'll bump your head, or stairs that "look" like your head won't hit until your head actually hits? My stairs were now in the latter category. This would not do. The solution, I decided, was to put two pie-shaped steps in the landing. After reading the Lowes book, I discovered that steps like these are called "winders" and they usually have 3 or 4 steps, not 2. I quickly realized that the stair book was right - 3 steps at 30 degrees each makes the most sense. To make "winders," you build a square box (the landing), a 60 degree pie shaped box, and a 30 degree pie shaped box. Screw/glue/nail these boxes on top of each other and voila - a set of winders. The picture shows my 30 degree box and my square landing. They are not yet attached to each other, because the 60 degree pie (not built yet at the time of this picture) goes between them. The code book says that winders must not come to a point, but I just didn't have room to build them any other way. I reasoned that if the hand rail was on the inside of the curving stairs, then no one would ever tend to step on the narrowest region of the stairs. Plus, the book from Lowes had a picture of how to build the non-code compliant stairs. How bad could they be? As it turns out, the stairs work great and we love them. The winders are not awkward to navigate at all, and changing the treads ("run") from 10" to 9+3/4" did not make the stairs uncomfortably steep. (the rise of these stairs is 7+11/16".) I plan to finish these stairs with hardwood risers and treads, but for now the 3/4" plywood, with the grain oriented properly, makes sufficient treads. Finally the day came...I had everything required to cover the sun room roof with standing seam metal, two able bodied helpers, and there were several sunny days in the forecast. The demolition went quickly - like pulling off a band-aid - it's best not to drag these things out! We were able to salvage a lot of the (now shorter) unwarped oak boards for later use as soffit. As soon as we had the t&g off, we went back over the ceiling with new poplar tongue and groove boards (the second picture). There's still a little bit of sanding and cleanup to do on the oak rafters, but so far I think the poplar looks great next to the oak. The very next step was to add a vapor barrier. (The vapor barrier should always go on the warm side of your insulation). Then we cut holes in the new t&g for four electrical boxes. We wired the electrical boxes with aluminum sheathed 12-2 wire. Then we put down 3" of poly-iso insulation between 2x4's on 2 foot centers. That's only about R-20, but the rest of my house has R-50 insulation in the roof, so I don't think it'll be too much of a heat loss over this small room. I had to keep the insulation minimal, or my roof would be too thick and start interfering with the windows above the roof. (see picture at left). Because this room had timber rafters, we ran the 2x4's crossways... like purlins. The timber rafter tails form a generous summer-sun blocking overhang at the eave of this room. To achieve sufficient overhang at the rake edges of the roof, we ran the 2x4's beyond the side walls of the sunroom. You could attach standing seam directly to the 2x4 purlins (like I did elsewhere on the roof), but I decided to run plywood on top of these 2x4's . I anticipate walking out on this roof and attaching various solar experiments to the standing seam roof, so I wanted to make sure there was a solid base beneath the roofing. I'll have more pictures of this roof and sunroom to show later. Rest assured though, that by the end of the second (long) day, we had the roof permanently dried in with standing seam metal! It took two more days to finish the metal trim, fascia, and soffit on the edges of this small (20.5' x 13.5') roof.